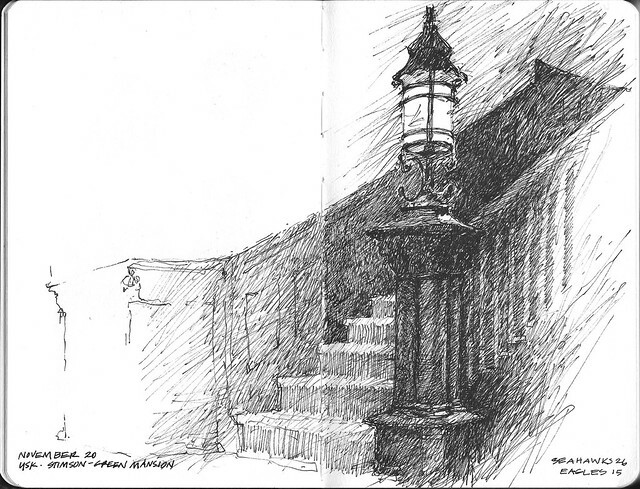 The staircase at the Stimson-Green Mansion in Seattle was a challenging sketch for me. But focusing on a detail like the lantern at the base of the stairs was a good way to keep from being overwhelmed by the complex interior of this historic building. As others have mentioned, I am very grateful to the Washington Trust for Historic Preservation for opening this house up to Urban Sketchers last week. As always your high contrast sketches are so lovely. These are a bit of a break from the norm with sketchy lines instead of more solid, graphic areas. Really nice.